I went by Target at 1 AM Friday morning just for the experience of being in a store at such an hour and to see what kind of people were out shopping at 1 AM. I was just there to observe, so that made it OK, though I did buy two items. lol. The other shoppers looked fine, though some were drunk and loud. Some of the prices were very good. I looked at televisions and the Nooks. Some were tempting, especially a Hello Kitty flatscreen TV, but I didn’t really need either in spite of trying hard to rationalize a purchase. I had to fall back on an old shopping mantra: sometimes the best way to save money is not to buy. I ended up walking out with just a carton of orange juice and a pair of sweatpants. The total was about $10. Here is how the store looked after midnight. I like how the parking lot light affected the camera. 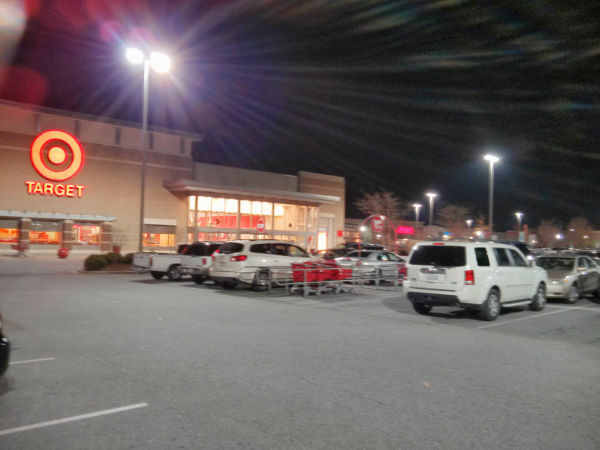 This entry was posted in rambling and tagged black friday, blackfriday, shopping, target. Bookmark the permalink. spending 10 dollars on black friday is my idea of a successful run! Even with my love of reading, I still don’t have an e-Reader. The closest I have come to that is some lunch break reading on the Google eBooks Android App on my ancient smartphone. I still don’t know about buying a real e-book reader. The one I have was a rock-bottom model from Wal-Mart for $30. It has wifi for downloading, but I usually just use the computer USB for file transfers. The display is comfortable. I got this cheap one to see if a reader was something I would use and like. When I look at the Nooks and Kindles in stores, the displays look very nice, some having what they call Paperwhite, which really does look like paper. I thought about getting an Android tablet, like a Google Nexus for e-book reading. I don’t know if the book reading display is as good as the real readers or not. I suspect all of them phone home with what you’re doing. There was the incident of Amazon deleting “1984” off Kindles awhile back. I’m still deciding. By the way, on Android, the Google ebook reader is fine. There are a couple of free 3rd party ones I have tried that also work well: Cool Reader and FBReader. I still haven’t read anything that has DRM. My public library wraps every single thing in layers of “protection” with just a few days of reading time available before having to get back online and renew. They farmed the entire e-book operation out to some 3rd party company that doesn’t care if it’s a major PITA.